Easily cut repetitive flutes to add some flair to columns, moldings, or even furniture parts. Flutes can be very eye catching additions to most any project, but they can also be very trying at times. Our fluting jig makes it simple by allowing you to rout clean, evenly spaced flutes every single time. 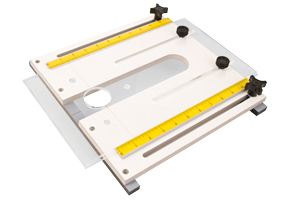 Built in rails under the jig keep the jig level, allowing it to slide along your work piece that can be up to 8” in width. Mount your router to the acrylic base that comes with the jig. Once mounted, the router slides laterally on the jig to rout out as many flutes as you need!